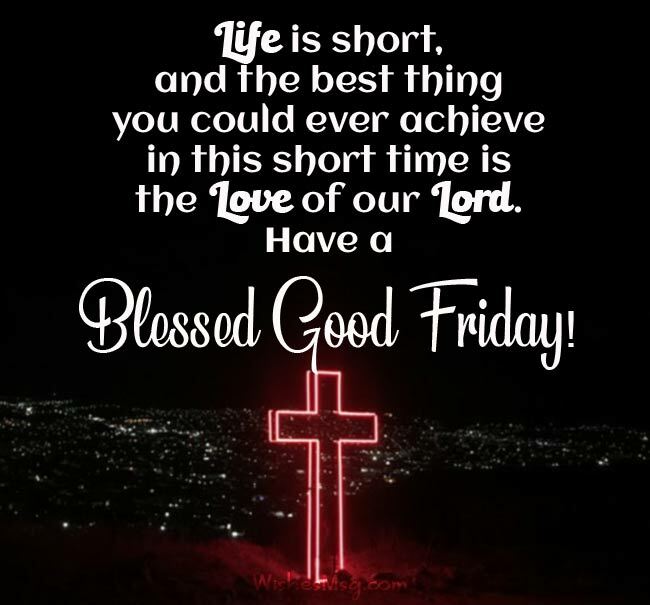 Good Friday Wishes Messages 2019: The crucifixion day of Jesus is called Good Friday, Holy Friday, also Easter Friday. It’s a day for commemorating the great sacrifice of Jesus, who gave away his life to save us from sins. He was born for us and he died for us. His death is an example of the ultimate sacrifice and unconditional love that teaches us a lot of things. Good Friday is a Holy day for every Christian. On this Holy day, everyone you held close deserves Good Friday Greetings from you. 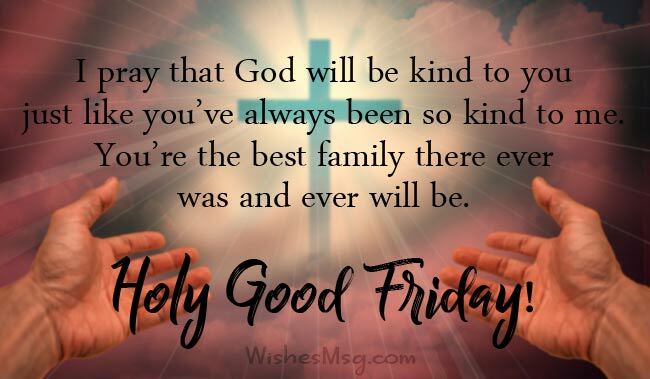 Your good Friday Messages need not be too formal, but they should express your thoughts, blessings, and prayers perfectly for the ones you care about. This good Friday wishes messages are best for wishing someone a peaceful life and a blissful day. So spread the spirit of Jesus by texting your loved one these good Friday wishes and greetings! May the sacrifice of our Savior be the inspiration for you to go forward and follow the light of redemption. Have a blissful time on this Holy Easter Friday! On this holy day, I pray to Lord that he keeps you safe always and surrounds your life with eternal love and happiness. Wishing you a Holy Good Friday! May Lord hear all your prayers and rewards with everything that you ask for. May he shower upon you the blessings of the heavens above. Happy Good Friday! We are blessed because Lord loves you. He was born for us and sacrificed his life for us. It’s a day to be grateful to our Lord for every pain he bored in silence. On this day, our Lord made a great sacrifice and freed us all from sins. Let us all take a moment and thank our Lord for all the love he has blessed us with. God is so kind and loving much that he sent us Jesus; his son, only to be crucified in order to free humankind from all the sins in life. On this day, be thankful to our dear Lord. May the love for Jesus in your heart grow stronger by each day. May you always be surrounded with love and care of our sweet Lord. Heartfelt Good Friday Greetings to you! Jesus held us so deer that he gave his life for saving us from sins. May you find your inspiration from this holy sacrifice of our savior. Happy Good Friday! On this holy day I pray that you always be in the loving blesses of our ever-graceful lord. Have a nice day full of bliss with your loved ones. May the sacrifice of Jesus give strength to your soul and light your way towards eternal happiness. Wishing you a Holy Good Friday! May the blessings of Lord always shine upon you like diamonds. May all of you always be happy and joyful in your life. Happy Good Friday! I pray that you are always surrounded by the loving care of our sweet lord. May he bring peace upon all of you and keep you safe always. I pray that God will be kind to you just like you have always been so kind to me. You are the best family there ever was and ever will be. Happy Good Friday to everyone! I wish all of you a long life full of success and prosperity. I pray to God that he gives you strength and bring the light of holiness in your lives! Happy Good Friday! I am proud to be a Christian and I’m lucky to be a part of you. Wishing my lovely family, a great day. 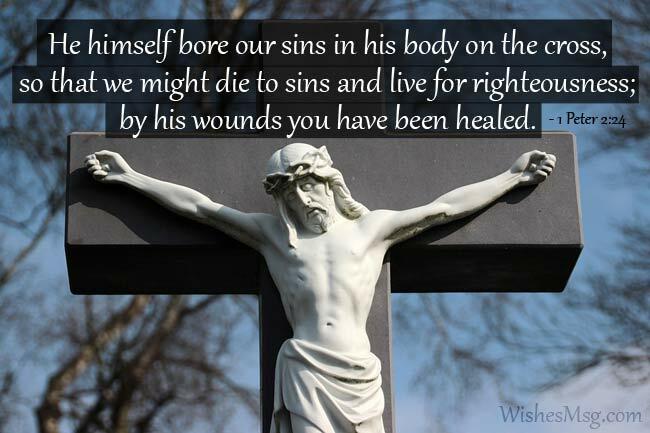 Holy Good Friday to you all! Today I thank Jesus for showing us the right way. He gave us the light that leads us to peace and salvation. Blessed Good Friday wishes to my family! May the love of Jesus fill your heart with heavenly bliss and holy desires for now and forever. Wishing you a Holy Good Friday! May the thoughts of the holy sacrifice of our sweet Lord clear your mind and fill it with hope and determination for a better life. 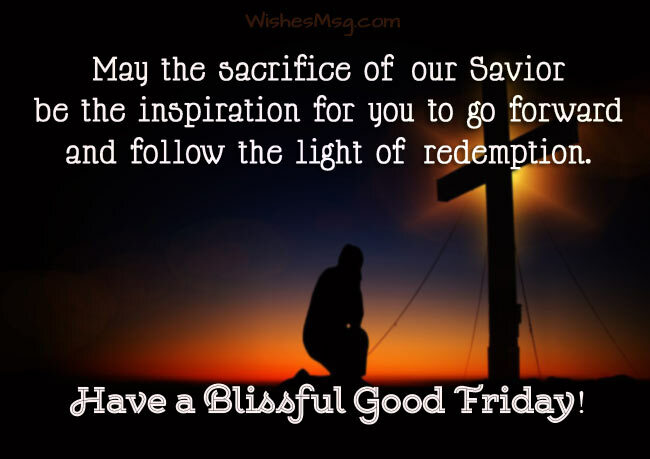 Have a blissful Good Friday! I pray for you that Jesus keeps you surrounded by happiness and fills your life with his blessings. I wish the best for you today. Good Friday Greetings to you! May you find strength in the name of Jesus and find peace in loving him. You are a good person and a great friend. 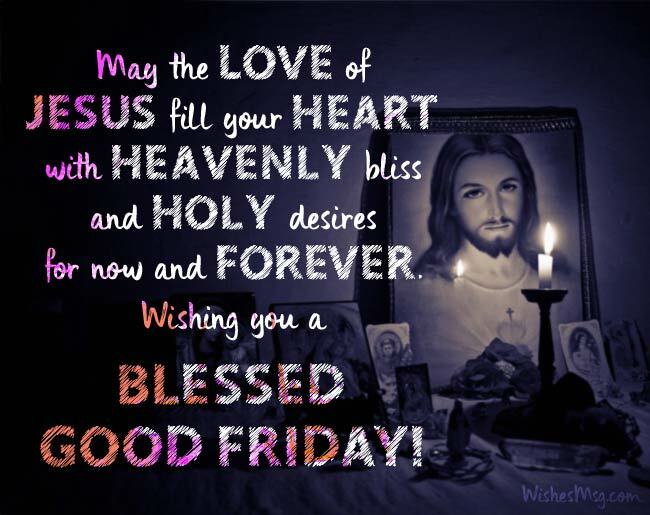 Good Friday blessings to you! When you think about Jesus’s great sacrifice for humanity, no problem in your life is a big problem anymore. Wish you all the best today! Whenever you are tired of working hard, think of our Lord and all the blessing he gave you in life. Wishing you a day of happiness and joy. Holy Good Friday! May this holy day bring you all the good moments in life that you have been waiting for. May you and your family find everlasting peace and prosperity! The unconditional love of Jesus for us is the biggest motivator for doing good things in life and being a good person in life. Happy Easter Friday! You are an amazing colleague. I pray that you are always happy and joyful like you always are. May God grants you everything you desire for. Have a blessed Good Friday! Life is short and the best thing you could ever achieve in this short time is the love of our Lord. Have a blessed day my dear. Wishing you a lot of luck and laughter. Good Friday is not only a day to mourn but also a day for celebrating the spirit of Jesus. It’s a day to recognize the good and leaving aside what’s bad. Good Friday teaches us to love unconditionally and to follow the path of Jesus even if it means death for us. Christianity is the right path that leads to an enlightened soul and a holy destination. The spirit of Jesus needs to be celebrated with the utmost enthusiasm so that everyone around us can feel the love and grace of our savior. 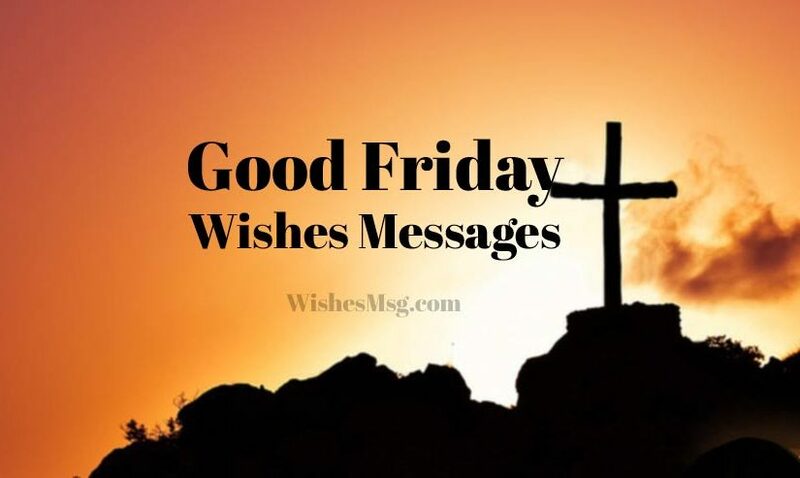 Good Friday wishes messages are exactly what you need to spread the love of Jesus on this Holy Easter Friday.